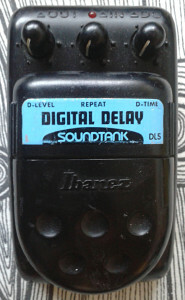 Ibanez DL5 Digital Delay from later Soundtank series. Made in taiwan in mid 90’s. Yes. The Ibanez’ weapon of choice for digital delay circuitry. Mitsubishi M50195 with 4164 DRAM chip as an companion. 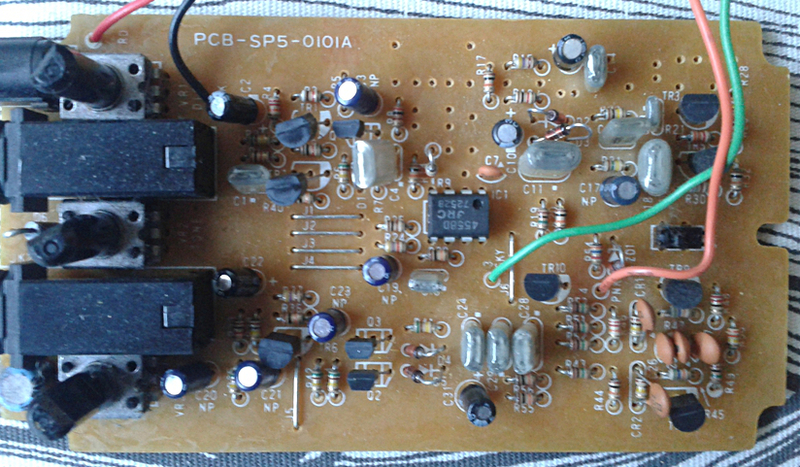 It may be more complex by the design than most current PT2399 based delays, but to my ears, it’s not any worse. On the contrary. 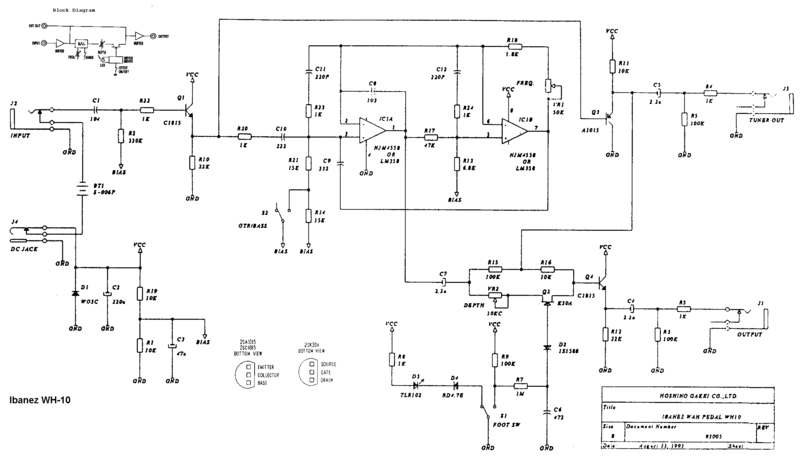 Check the schematic and see for yourself. One is online and can be found via google. 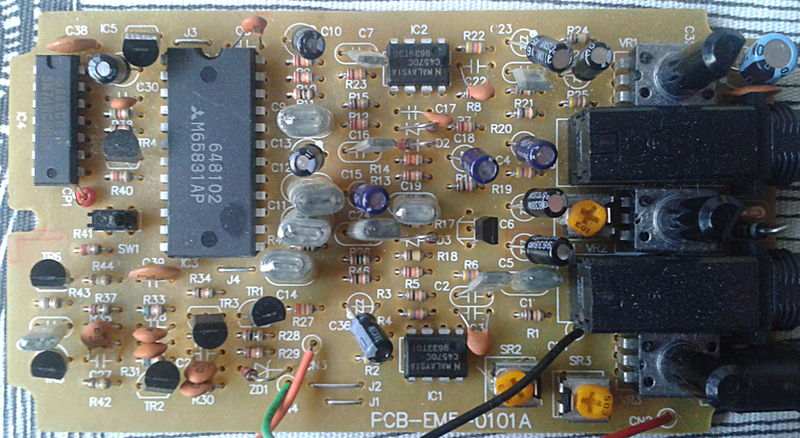 There are couple 5218A opamps that take care of the mixing and buffering. 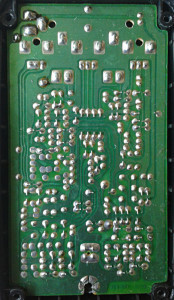 Board features standard Ibanez JFET swicthing with 74HCU04 logic chip and a trimmer to handle delay time range. The board is in good use with not much free space. Neat. Indeed. Warmer than most competitors with a hit status. Nice analog feel to it, but with a lot less noise and sharper sounding control to repeats than BBD-clocked analog counterparts. 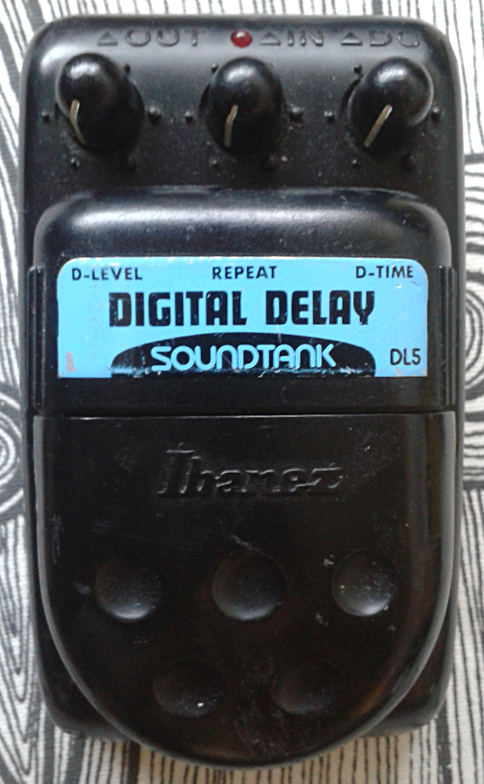 It does wide range of delay timing and can be mixed all the way up to being almost 100% wet. No wonder it’s still a popular and widely used pedal. Good delay with simple controls. Max the repeats and you’re off to noise land with neverending feedback. 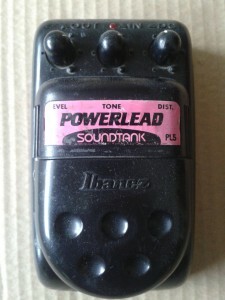 Ibanez PL5 Powerlead from Soundtank series in a plastic enclosure. Made in taiwan around 1993. 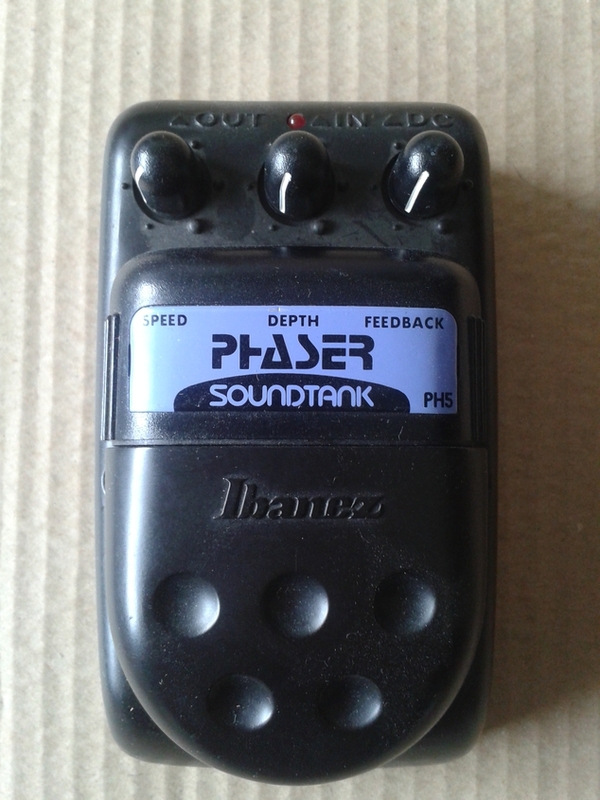 I also have another one of these, build around 1996, in mint condition and in its original cardboard box. The whole series doesn’t disappoint much in terms of dirtbox quality. Most of them sound just right, but there are couple exceptions. This being one of them. Apparently the Powerlead was the second most sold design of all Soundtanks – only falling behind TS5 sales. Amounts originally sold make this very common design, so anyone should be able to score one for cheap. Is it worth it? I can’t be certain about that. But it is definitely not the worst dirt box in the series. Schematic is available online. 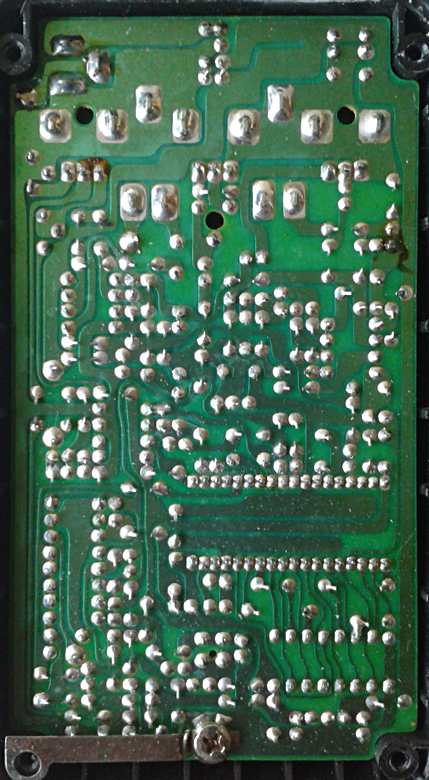 Looking at the schematic, there’s your standard Ibanez buffering and electronic switching, which passes the signal to single transistor gain stage. 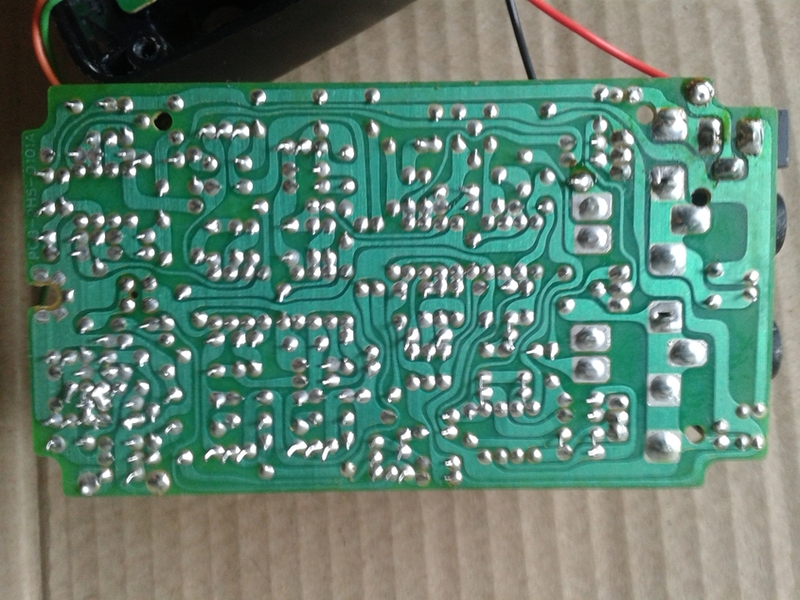 After this, the main gain stage is basically a YAR with it’s hard clipping diodes and couple of the component values reworked. The tone control after the YAR is not you standard passive treble cutter, but tri-gyrator to tweak the frequencies that get passed forward. Lastly there is quite standard volume control that mixes the signal passage between Vref voltage (virtual ground) and the output buffering. It is equipped with JRC4558D, and there are some things that can improve the performance. 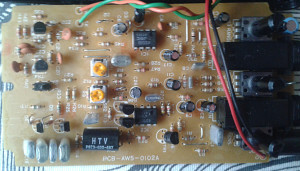 Swapping couple of components is on my to-do list and i’m committed to mod this particular unit once i get to it. 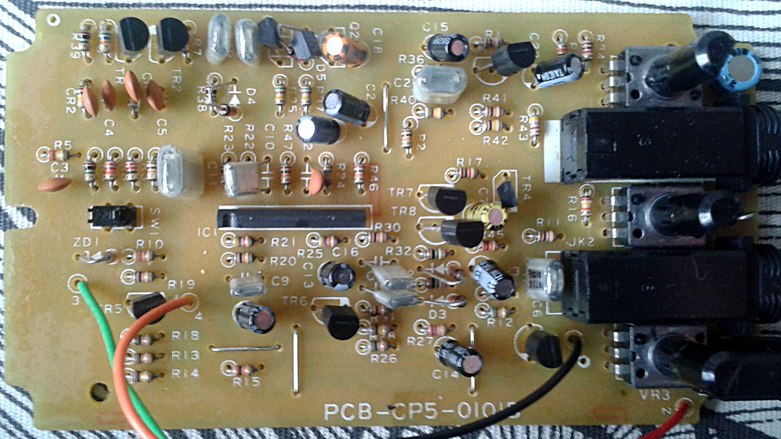 Tweaking the first, discrete gain stage to push the main gain stage more is where i’ll begin. 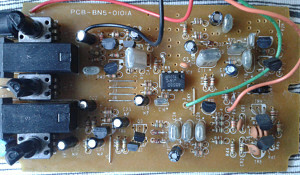 Then swapping the 220R resistor for 22K to bring out more gain of the main stage. The two paths to ground from non-inverting input should be tweaked too. 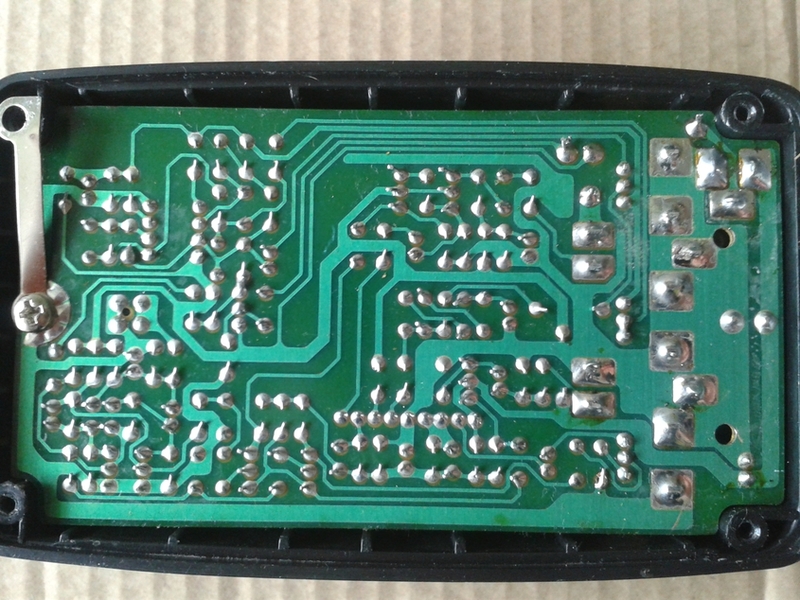 Lastly the clipper diodes could be swapped for LEDs or even two pairs to push it slightly further. It may need some other swaps too, but we’ll see about those once i open it up on my bench again. Not great. At first the tone control feels to be working wrong. It basically adds low frequencies when turned clockwise. Overall tone is big and distorted, but still it doesn’t thrill me. Name says it all. It offers powerful lead tone that’s not completely unlike the classic hair metal guitar solos of the early nineties. Not great, but not too bad either. Definitely next from worst of the original six pack, right after Modern Fusion. 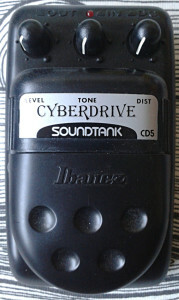 The marketing section of Ibanez pedals made this out to be a “industrial” distortion. It’s how the marketing can turn a design to something that it is not – and then people will hate and slander the design for years to come because the marketed sound doesn’t have too much to do with the reality. I could sink this one deep into that category. In the day, the name and marketing suggested that the unit is “Lethal, rough-edged industrial distortion at its most extreme-the sound of a small amp overdriven way past the limits. Our heaviest, most intense, and just plain loudest distortion pedal.” it does sound like marketing jargon that promises to deliver, now doesn’t it? Does the reality support that description? Don’t get me wrong. It has some of that AC15 driven over the limits feel to it. So it’s not all wrong, but still. I’ve ran into similar issues with other pedals too. The marketing has us believing one thing that the unit does not offer. That can lead to severe disappointments and hurt the brand as much as the individual design in eyes of the users. Let’s leave the marketing section behind and focus on the pedal itself. The silk screened label clearly has BN5 on it. Lots of unused holes? And doesn’t the layout look familiar? 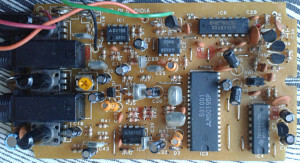 How about we take a look at the schematic (from Dirk’s archives). Next, take a second to compare it with the SP5 schematic. Topology is the same. 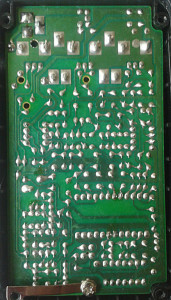 The board layout is the same, minus the silk screen labelling. I guess i need to check other pedals from this series to see which ones have the same board layout. Deep inside this is just another Rat/TS adaptation with standard distortion box analogy. 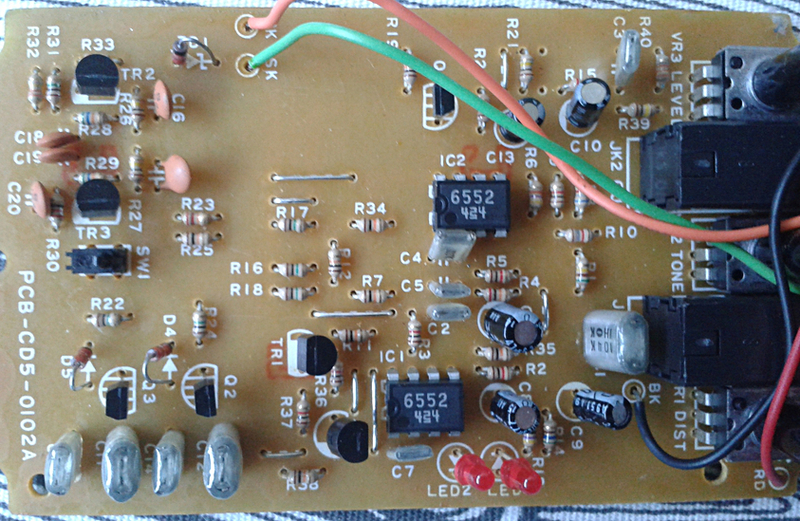 Buffer -> main gain stage -> hard clipping -> tone control and static gyrator filters -> output level control -> output buffer. 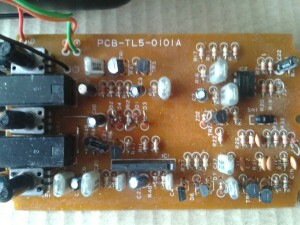 Souped with electronic switching and bypass. There are at least four similar designs in the series, all with slightly different frequency responses that result in different overall feel. High gainer that’s not bad at all. Feeling slightly harsher and louder than Slam Punk, but basically hailing from the same neighbourhood. 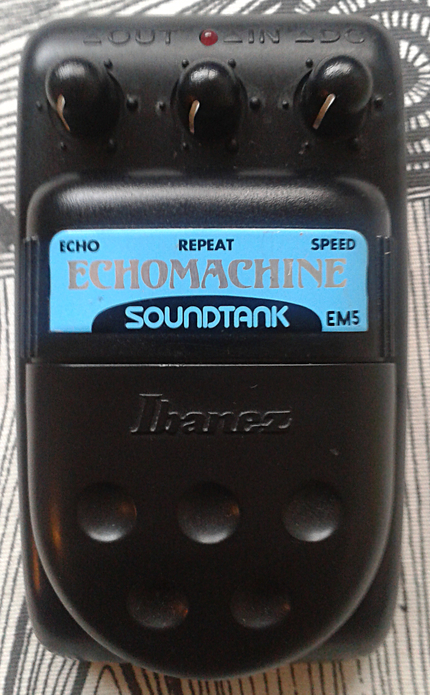 My first impression isn’t placing this to industrial music genre, but to the same lot with TM5, CM5, PL5 and SP5. All are very nice sounding distortion pedals with slight or slightly bigger differences. All of them do sound good. As the Soundtank distortions come, this is one of the really good ones. Ibanez AW5 Autowah in plastic enclosure from later soundtank series. Made in taiwan around late 80’s. This model has couple things that are unique. First of all, it is the only Soundtank with analog opto-isolator on board. 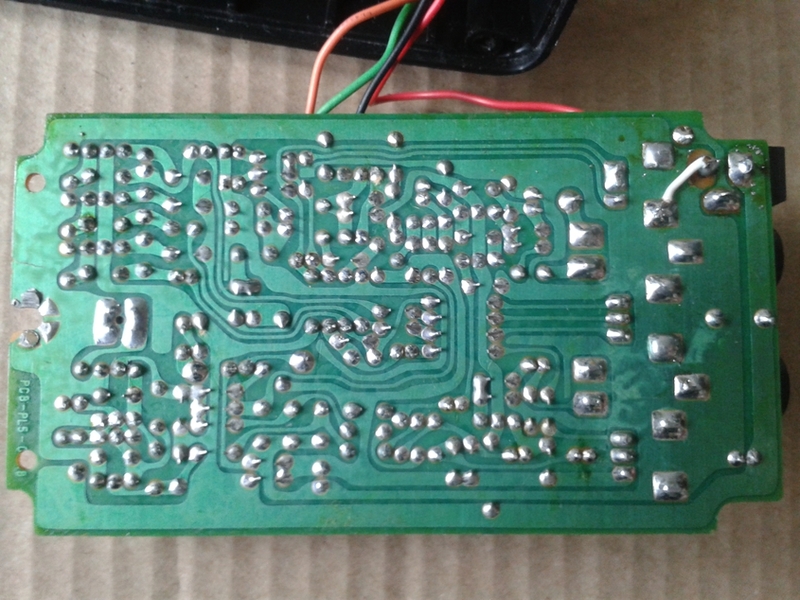 The box and the component layout itself is quite neat. 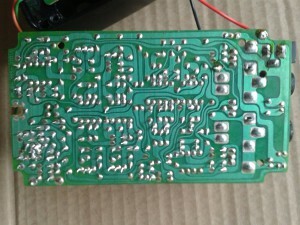 It’s pretty well made and placing high on build quality in the series.There is a schematic up at Dirk’s page. 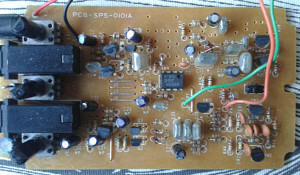 The schematic shows the basic signal path to be a buffer splitting the signal to bypass, modulation filter and the trigger part. The trigger part is close to something we’ve seen as a trigger in many other designs, like couple of EHX autowahs. 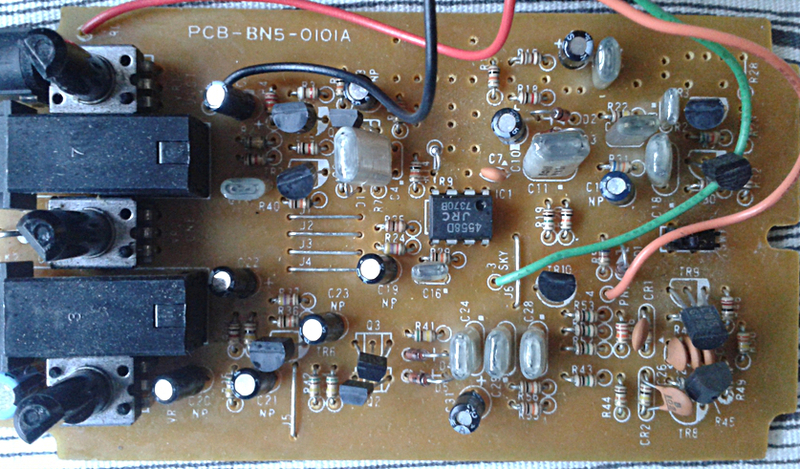 It Includes half of an dual opamp and two diodes rectifying the triggered signal to two transistors which in part control the vactrol (or opto-isolator). The filter part is not too far off from WH10 and others. 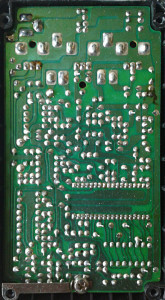 Then there is, of course, a output buffer and all the standard Ibanez electronic JFET switching components. All in all. Elegant design. 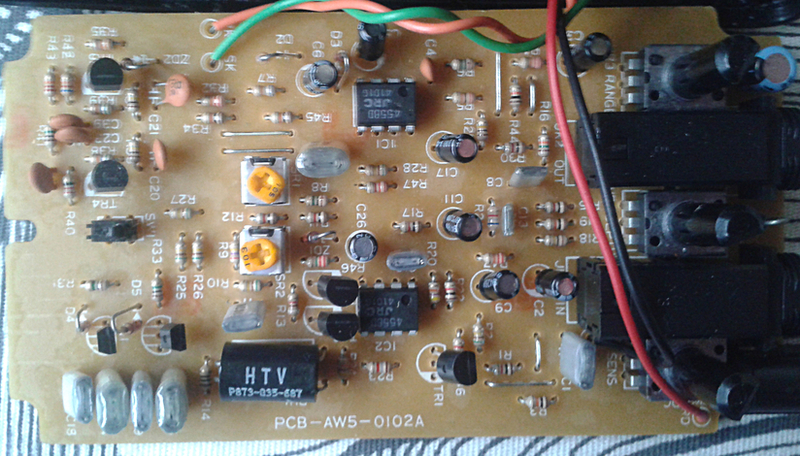 By the basic design, this should be very nice autowah. But is it? Sad. For obvious reasons one could have AF9 or AFL in mind once seeing this unit. It does not sound anything like the early 80s Ibanez perfection from 9- or Master series. It gets the job done, but overall it is sounding like a hollow, cheap thing. I may not be the greatest expert on autowahs, but i apparently have quite a few effect boxes from that genre. This one? Definitely not one of the greatest. Actually. One of the worst. You’re after a usable autowah in low price range? You should be looking at Dano French Fries instead. This one is much more of an nice novelty effect or a collector’s item than usable effect pedal. Ibanez TL5 Tremolo from soundtank series in plastic enclosure. Made in taiwan around 1995. 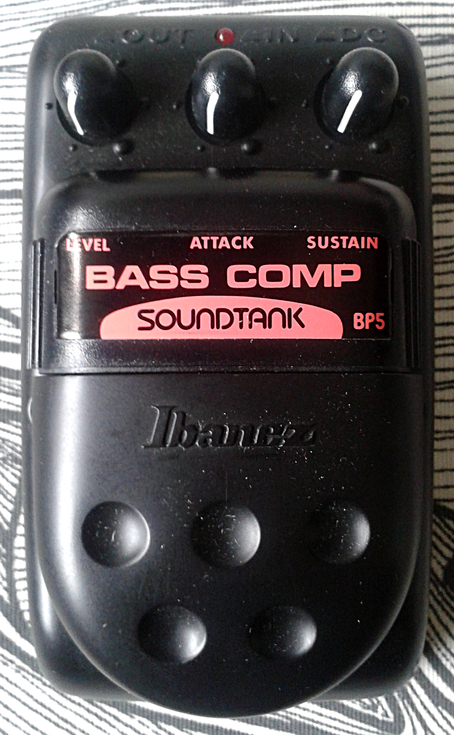 There are just a few highly peculiar effects in whole Ibanez catalog fom the seventies to today. This is one of them. Only tremolo Ibanez ever produced. And to be honest, the design isn’t bad at all. 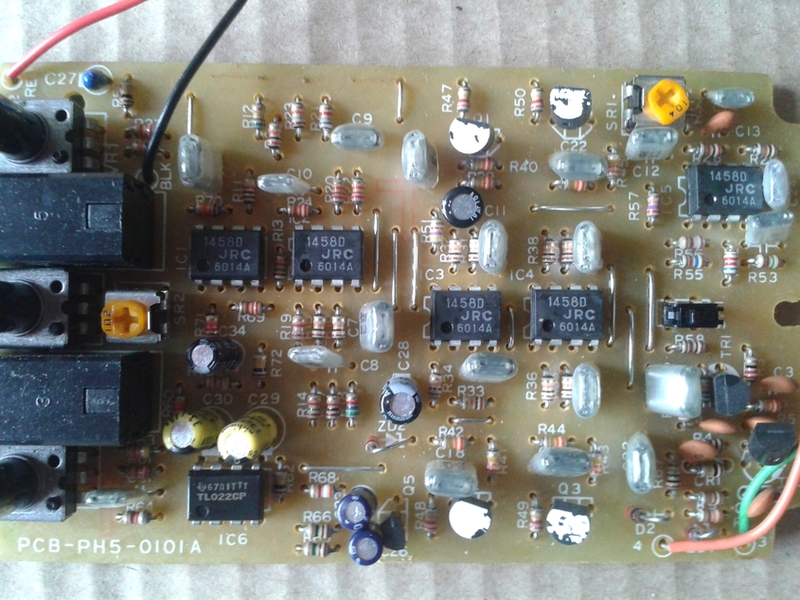 In all the simplicity, there’s TL022 opamp that acts as a LFO – which then controls the amplitude of BA6110 SIP voltage controlled amplifier. Dirk has drawn a beautiful schematic and posted it on his site. The idea of using a VCA for amplitube modulation isn’t as popular method as i thought. 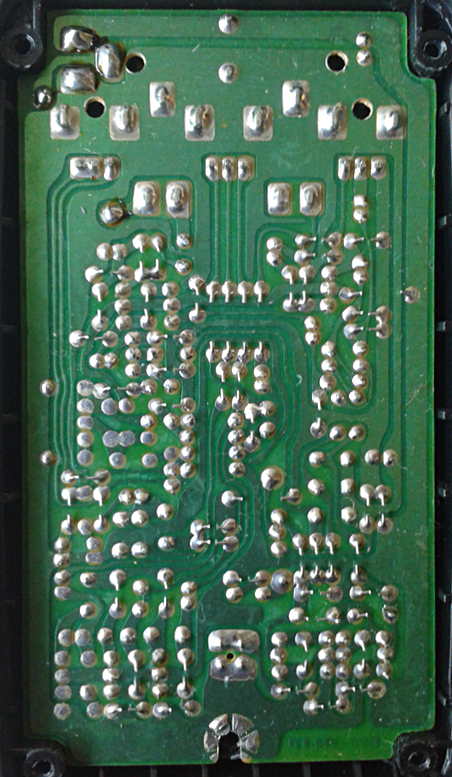 The optical Vactrol and FET methods are present in more common designs. 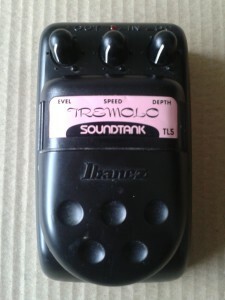 So this isn’t only special for Ibanez, but for the whole subgenre of tremolos. 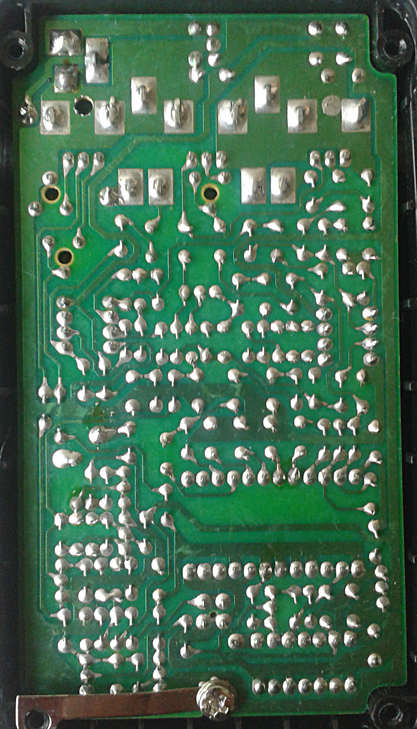 I’ve seen a few designs even utilizing a OTA for a tremolo effect, but for me, this was the first design with a VCA. 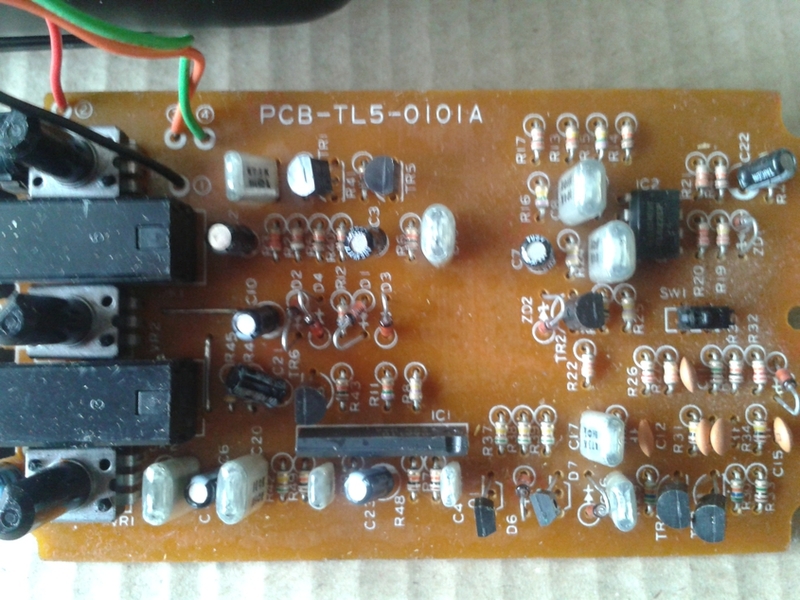 Also the one transistor that’s controlled by LFO and pulsing the status LED is very nicely designed. 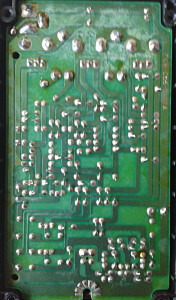 Traces look sort of like modern japanese drawing of a tree and the solder joints are neat. Components are also placed in very neatly. It’s getting harder to find anything really wrong with this unit. 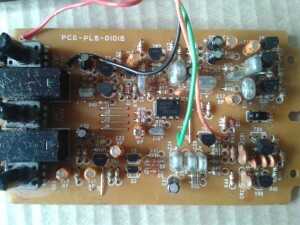 Component side is one of the roomier ones in whole soundtank series. 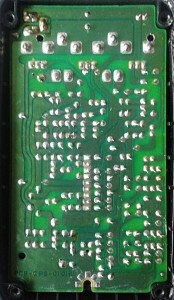 The way all the 1/8W resistors are laid in straight sets is also very eye pleasing. The biggest culprit once again is the switch. Replacing it isn’t that big of a task and is recommended as most of the original switches in this series will die eventually. All in all, this one is a must have. Ibanez (or basically Maxon) design that is at the same time quite original and versatile. Springs up a question. 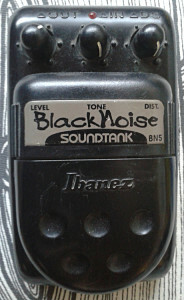 Why Ibanez didn’t ever made another tremolo for any other series? 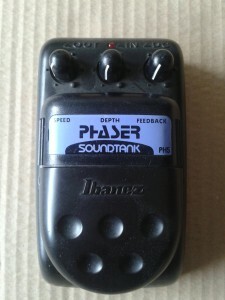 In my opinion this doesn’t matter as now we have here a piece of Ibanez effect pedal history that will be a highly valued collectors item for its sound and design. Some people might argue that the value has already climbed to where it should be. I’d have to agree on that. If you are lucky, you can still find one for cheap. Like a world class tremolo. Soft with reasonably wide range of speeds and depths. 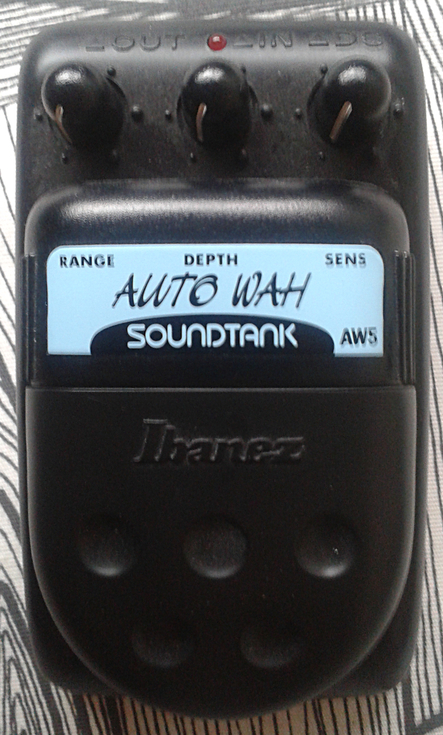 The level control lets you boost the signal slightly to avoid all psychoaural volume drop issues. Really nice tremolo. One of the great beasts in a plastic box. Highly recommended pedal. 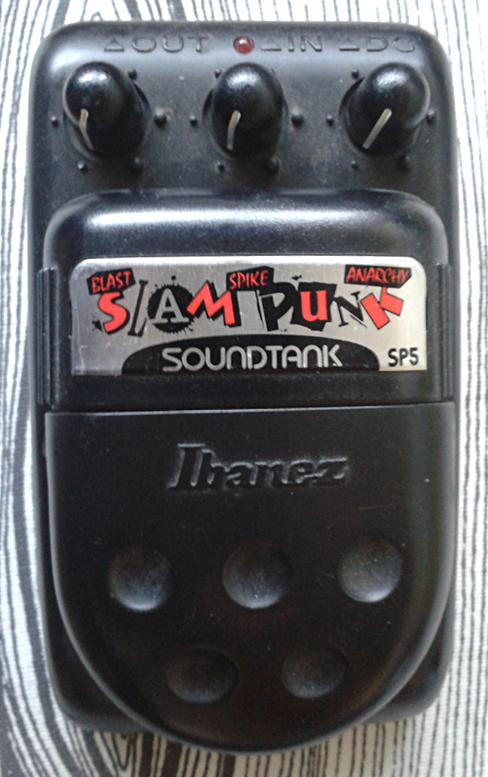 Ibanez SP5 Slam Punk distortion from later Soundtank series. Made in taiwan, mid to late 90’s. One of the soundtanks that i had a pleasure of being in contact with before acquiring one. I did a rehousing job with true bypass for a friend and played with the circuit before letting it go. 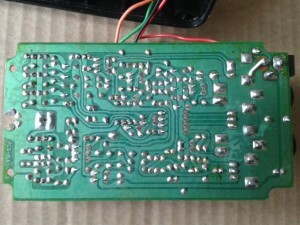 I knew then already that i may need to clone this circuit for myself, and maybe mod it slightly to lose some of the low cut that the original pedal had. Not much, but still the original had slightly clinical bottom end. After building couple of clones, to no surprise, i found another healthy original for reasonable price. This puppy is that one and i’m not letting it go. 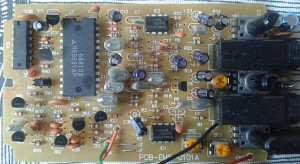 The board has standard taiwan modern traces. Take a note of the empty, unmarked holes. 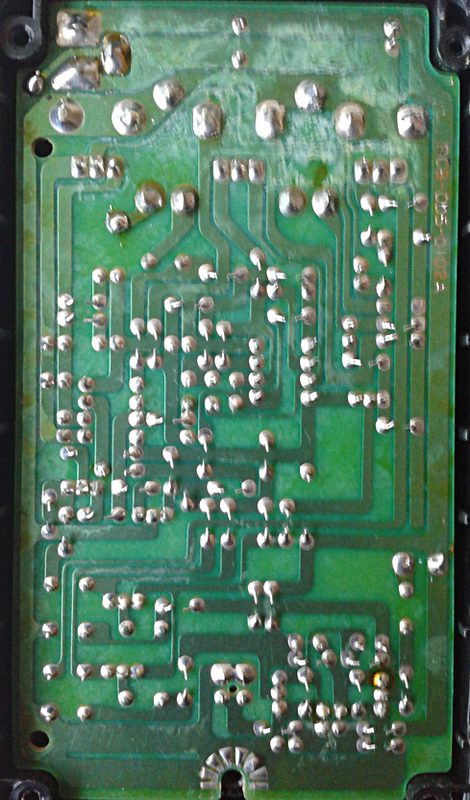 The board has SP5 printed on it, so the exactly same board hasn’t been used for another desing in this series. But i do believe the layout without the silk screening has been. However. 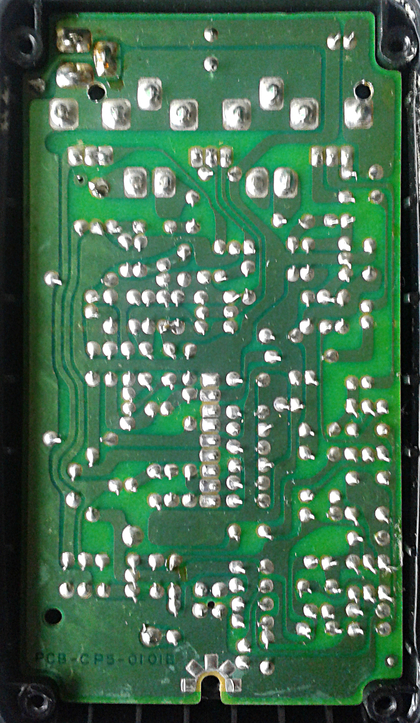 The schematic is up at 8bitsindgenug. 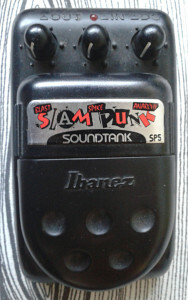 It shows some similarities to ProCo Rat and other Ibanez designs based on it. The board has a lot of room on it. 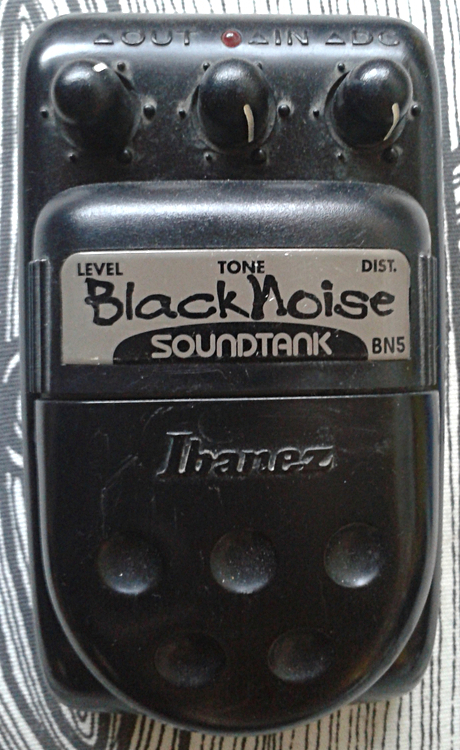 Even though the Soundtanks aren’t getting the appreciation they should in general, this one is one of the most underrated pedals in the series with Black Noise and a few others. Nevermind the plastic housing. The sound is there, regardless of the box. 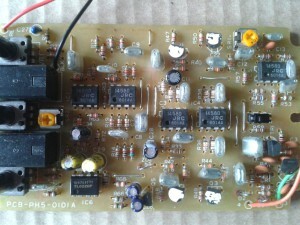 High gain accuracy and definition, but still usable as a very nice overdrive. Think of Social Distortion’s “When the angels sing”. This pedal pretty much nails that overdriven/distorted base sound. No doubt this pedal wasn’t used on the recording, but the sound is close. Anyone mocking this one as a plastic cheap crap should play with one and say that again. Entries (RSS) and Comments (RSS). 52 queries in 0.234 seconds.